We know that low instruments can do much more than play functional bass notes, but it’s good to be reminded of it now and then. The name Lyrisch Laag (lyrically low) says it all as far as that goes. This concert will focus on the richness of the lower regions of the sound spectrum. Two bass clarinets and two low string instruments will play in various formations, with brand-new works by Michael Finnissy, Georgia Nicolaou and Frederik Neyrinck. Composer and pianist Frederik Neyrinck (°1985) studied in Brussels, Stuttgart and Graz. He lives and works in Vienna. He has worked with various ensembles and organisations such as Asko|Schönberg, Bozzini Quartet and Brussels Philharmonic, and his works have been recorded by I Solisti del Vento, Spectra Ensemble and Revue Blanche among others. In 2017-2018, he is “season’s composer” at Concertgebouw Brugge. As a pianist, he is member of Ensemble Platypus. Composer Michael Finnissy (°1946) is concerned with the political aspects of music. He believes that all music is 'programmatic' to some degree, it exists within a culture that reflects both the extra-musical and purely musical concerns of the composer. It is a force for change. His engagement with political and social themes has become more prominent as his career progressed. Finnissy has taught at the Royal Academy of Music, the University of Sussex, and is currently Professor of composition at the University of Southampton. In 2016, Georgia Nicolaou completed her Master’s degree in Composition at Codarts, Rotterdam. Her works include pieces for chamber ensembles as well as compositions for dance and music theatre. Besides acoustic, she also composes electronic and electroacoustic music. In September 2016 she was awarded the Tera de Marez Oyens prize for her work S o c I a l I C E, during the Gaudeamus Festival for contemporary music in Utrecht. Lyrisch Laag (Lyrically Low) is an initiative of Fie Schouten, where various musicians come together to play instruments with low tessitura. For this concert she joins forces with Marij van Gorkom, with whom she also forms the ensemble Baklarinet Festijn, as well as cellist Eva van de Poll and double bass player Beltane Ruiz Molina. Fie Schouten (clarinet, right) specializes in contemporary music. She is head teacher of bass clarinet at the Prins Claus Conservatorium Groningen. Schouten regularly performs as a soloist as well as with diverse ensembles, and is the artistic director of the Basklarinet Festijn. She also collaborates often with celebrated and young composers, that have written over seventy pieces for her and her ensembles. 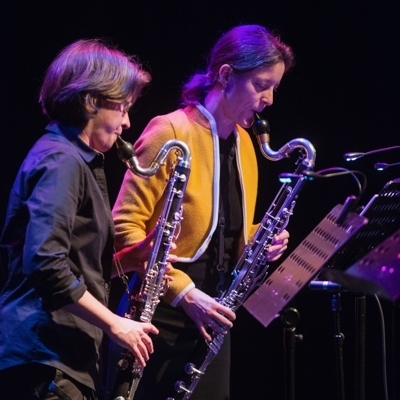 Marij van Gorkom (left) studied bass clarinet with Harry Sparnaay and since devoted herself to her project Sonic Spaces, through which she seeks to further her instrument, create new music, and find her own path within today's music and art. It allows her to discover new musical possibilities and explore the depths, details, and nuances of her instrument as well as its relationship to electronics and digital media. Cellist Eva van de Poll studied at the Conservatorium Amsterdam and the Messiaen Akademie. She’s earned her stripes collaborating on film, theater and dance performances, world music and contemporary chamber music projects at home and abroad. Eva is part of theater group Plezant, Pavadita Tango String Quartet and the Haytham Safia Quartet and has toured with various musicians. Since 2001, she collaborates with Fie Schouten. Beltane Ruiz Molina studied bass and composition in London and Berlin and a Master in early music in Basel. She has worked with the most prominent modern orchestras and conductors in England, Germany and the Netherlands. She often plays with contemporary music ensembles like KNM Ensemble, Ensemble Adapter and Ensemble. Since 2010 she is member of Zafraan Ensemble Berlin.